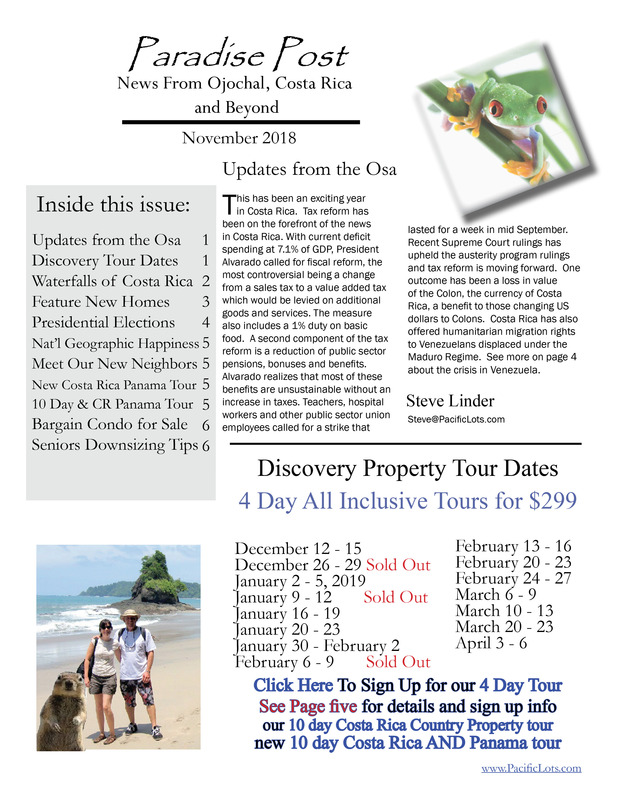 November 2018 Issue of the Paradise Post - Here's the latest issue of the newsletter with stories about The Waterfalls of Costa Rica, Downsizing Tips, Feature new homes, meet our neighbors, a bargain condo for sale in Guanacaste, the presidential elections and more. January 2018 Issue of the Paradise Post - Here's the latest issue of our newsletter with stories about the Presidential elections in Costa Rica, a new luxury hotel and restaurant recently opened in Ojochal, festivals at this time of the year, the Duran Sanatorium, touring the Tarcoles River, National Geographic Magazines recent ranking of Costa Rica's happiness, meet our new neighbors and more. October 2017 Issue of the Paradise Post - Here's the October 2017 issue of the Paradise Post, with stories about the cost and damage inflicted this year by hurricanes and fires in the US, updates from the Osa region of Costa Rica, a new trade agreement with Canada, some new home photos in our community, tourism updates, new home centers in our area, new pavement in Ojochal and more. January 2017 Issue of the Paradise Post - Here's the January 2017 issue of the Paradise Post, with stories about new development in the Golfo Dulce, new international airline carriers into San Jose, about the domestic airlines of Costa Rica, the Carumbola (star fruit), Our new drone and much more. October 2016 Issue of the Paradise Post - Here's the October 2016 issue of the Paradise Post, with stories about health, banking, drones, our new video link, meet our new neighbors and more. Read about Costa Rica's new tax reforms, the top 5 companies in Costa Rica, IRS tax changes and implications of FATCA, the Rio Tico Safari Lodge, the Great Green Macaw Release (part II), Costa Rica's environmental performance, Standard and Poor's rating, health tourism expansion, a new ecosystem discovered and much more.